When Tony was a kid he was captivated by things with motors and he recalled his first strong urge to own a dirt bike. Christmas came around and he made his desires known that it was either a dirt bike or nothing at all for Christmas. Unfortunately for Tony his parents chose nothing over dirt bike, but the love for motorized vehicles was set. Later on his mom asked him to research ’68 Camaros she could buy for his dad as a present, but the more he read the more he knew he needed his own muscle car. He worked hard the next year, saved money and got his first car, a Green 71 Dodge Demon. 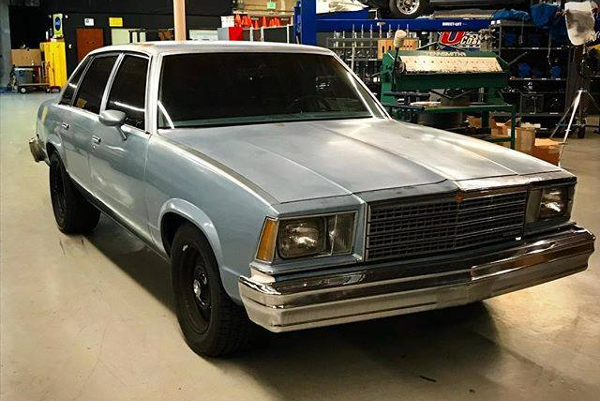 This is the same car featured in Hot Rod Garage episode 33 where it finally got the engine and suspension he wanted it to have. After high school Tony went on to college but his heart was not in it. The school took issue with him missing classes to work on cars and even at one point he had a motorcycle in his dorm room. He said he was back out of college by Thanksgiving. 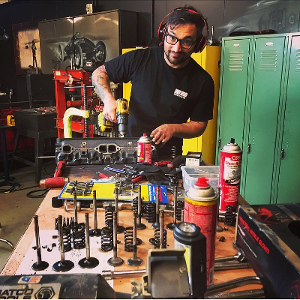 Tony started working in shops and garages building fast cars like RX7’s at a time when people were not hot rodding those vehicles much. He was introduced to some Japanese drifting videos and knew he had to do that with the cars he had. The drifting culture was not active in the eastern towns so they loaded the cars on a trailer and headed to California to do whatever it took to go racing. The timing was perfect that drifting caught on and Tony found himself in the position of being an experienced drift racer. He was either “rock star” or homeless depending on the weekend. Other drifters started doing double duty as stunt drivers in movies since the skill set was similar. Tony started doing stunt driving on the side also and could not believe he was getting paid to do it. Of course California is the place for movies, and media so was the place to be for a young stunt driver. Tony went back out to California during the cold eastern winter to get more drive time and do some stunt work. He was attempting to get into the screen actors guild to do more union jobs when he heard about an open call for a Hot Rod Garage show. Tony threw together a short intro video, crossed his fingers and applied for the job. He continued to work other places and decided to check back in to see what was going on with the job since he had not heard back. They said they were still looking and was asked to do a face to face with Freiburger. Apparently the interview went well and the rest is history. 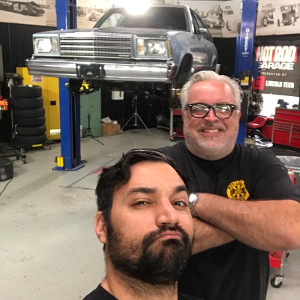 You can see Tony today on the Hot Rod Garage, featured on Motor Trend On Demand on Instagram.com/tangelo96 or on Facebook.com/tangelodrift. VALVOLINE ‘Never Idle’ from Salomon Ligthelm on Vimeo.